I realize this looks very haphazard and more than just a bit cluttered - messy even! But I love it! I like all the colors, text and the very fullness of it all. I love the very hodgepodginess of it. What does that say about me, lol? Anyway, I will break down the details a bit later today. We have much to get through this morning over here - and a birthday party later this afternoon! Fun! Have a blessed day with your loved ones! Saxon Math (natch) along with a tape measure. Crackerjack and Bookworm are keeping record of random measurements around the house. Geography from A to Z: A picture Glossary ~ We're taking 1-2 terms a week, and writing them down in small booklets. So for instance, we read the definition of archipelago, the boys copied it into their booklets and from there we looked for examples, in this case Rudolph's Shiny New Year. Remember the Archipelago of Last Year? Hey, it worked! New favorite Christmas book alert! The Little Drummer Mouse. When I have more time, I will write a proper review, but trust me, its a keeper. Earlybird will learn the farm animal names and noises (though he knows them all for the most part, we'll work on pronunciation). We'll play a farm game and look at preschool farm books. Of course, we'll bring out the large wooden barn and carved animals, too. Animal Planet has an interesting site on the Animals of the Nativity. I haven't looked at it too closely but it looks promising. We'll all read The Hat - a wonderful story about the antics of several farm animals - and we'll tip our hats to its illustrator, one of our favorites - whose birthday it is today! Jan Brett books figure prominently in our homeschool library, in particular her many Christmas and wintery ones. 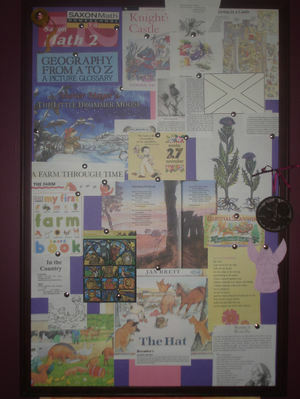 In the center of the board you see a lovely poem I found in A Year Full of Poems, called Christmas Daybreak. I will post the text soon when I have a bit more time. Down the righthand side of the board you see a few plans for honoring St. Andrew's feast day, which just passed this week. Since he is the patron of Scotland we'll look at the country's flag (and find out why this particular cross is used) and we'll also look at the country's flower, the thistle. I happen to have a delicous tea (Sugar Cookie Sleigh Ride) which lists milk thistle as its first ingredient, and Mary's Flowers talks at great lengths about the Marian legend of this flower. We will also make shortbread, a Scottish treat - using the mold I purchased earlier this year - the beautifully carved symbols of the British Isles (Scotland's thistle, a rose for England, shamrocks for Ireland, leeks for Wales). And of course we'll take a few minutes to read what Ms. Comstock has to say about this prickly but lovely hued plant. Finally you see our angel from The Giving Tree at church, reminding us of our promise to return designated gifts by this Sunday. And lastly a prayer for Dorothy Day whose birthday was this past week. Well, there are the details in a nutshell! As I said, I'll do some tweaking for next week and post again soon!